A new Grand Canyon University tutoring center for urban Phoenix high school students was lauded Wednesday as a potential national model for collaborative learning and an example of how private universities and public schools can work together for the common good. The GCU Learning Lounge held a ribbon cutting and open house on Wednesday, and those assembled heard from Claudio Coria (right), the principal at Alhambra High School. During a ribbon-cutting ceremony attended by dozens of education dignitaries, faculty, staff and students, the Learning Lounge was introduced as a comfortable, safe environment where students from Alhambra High School can work on their math and reading skills with GCU students – and gain important confidence — each weekday afternoon in free, one-on-one sessions. 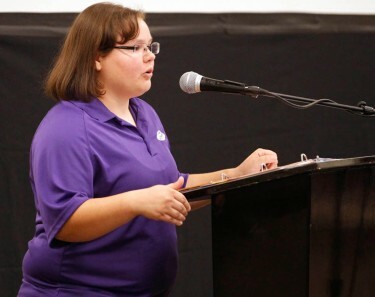 Brian Mueller, GCU’s president and CEO, approached Kent Scribner, superintendent of the Phoenix Union High School District, about a year ago to see what the University could do to help Alhambra, less than a half-mile west of campus. Students at Alhambra, where more than 70 languages are spoken, have challenges with understanding English and staying put, because their families often move, Scribner said. “But our kids have great assets, and we need to invest in those assets,” Scribner said. The time is right for such collaboration, Mueller said. GCU junior Holly McCarthy and Alhambra sophomore Mu Par are two such people. McCarthy helped Par rewrite an essay, working together for nearly four hours after school. Par had to be persuaded to take a brief break. “I’d never seen anyone so eager to come to do their homework,” McCarthy said. “By the end of the session, she had a big smile on her face because she was finding her own mistakes, and she knew how to correct them without me telling her. Alhambra’s principal, Claudio Coria, pointed out the significant ways GCU has been a good neighbor to his school – from helping improve public safety in the area and encouraging concurrent enrollment of students to contributing to a program in science, technology, engineering and math and now the Learning Lounge. “Our goal is not just to graduate students from Alhambra, our goal now is to ensure our students are amply prepared to transition to college and, hopefully, university, and be successful,” Coria said. Yadira Fregoso, an Alhambra junior who is on track to graduate, is an example of the results extra attention can produce. English is not Fregoso’s first language, and she struggled in school until the third grade, when family members, who did not understand much English, forced her to read street signs and cereal boxes. “They made it a game, and I started reading more and getting into my classes,” said Fregoso, one of several top Alhambra students at Wednesday’s event. The lounge, a large, welcoming space just west of campus where students can curl up on couches to read, meet with tutors in private offices or practice their work on computers, already has success stories, said Dr. Joe Veres, GCU’s director of K-12 outreach. Veres told the story of an Alhambra student who was tutored at the lounge one afternoon and then had the same material in class the next day. His teacher wanted to know if anyone in the room could help those who didn’t understand it. “He told us it was the first time he was able to raise his hand in class,” Veres said. Freshman DeeSember Corrales is another member of the team of 30 tutors working at the lounge. Ashlyne Matthews, a freshman communications major, has been tutoring the same two Alhambra students in reading and basic math. Drawing on what helped her not so long ago in high school, when she had difficulty with math, Matthews creates worksheets with basic operations and steps and gives them to the students to practice at home. Earlier in the week, Hawa Abukar, whose Alhambra counselor told her about the Learning Lounge, was working on math problems on a computer before sitting down with Matthews to go over her answers. Mueller said the Learning Lounge’s big picture extends beyond the campuses of GCU and Alhambra.